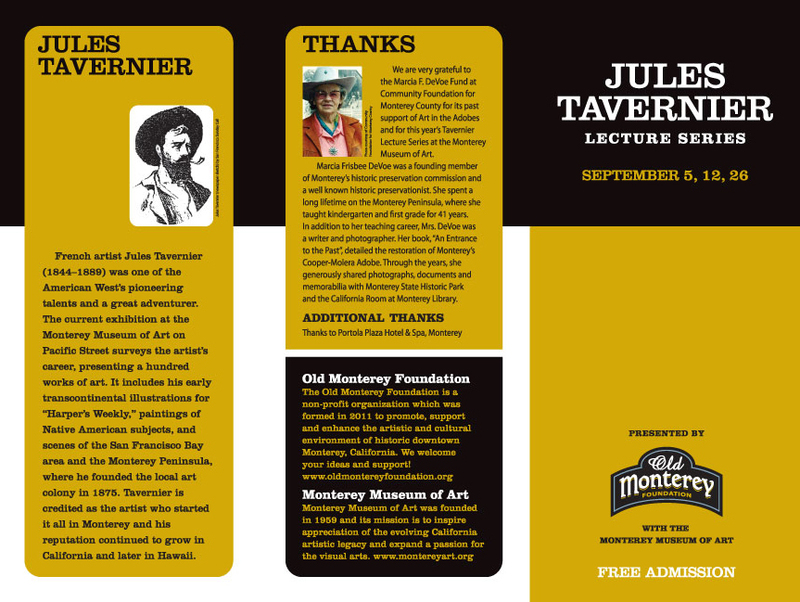 Old Monterey Foundation in collaboration with Monterey Museum of Art presents the Jules Tavernier Lecture Series September 5, 12, and 26. Jules Tavernier (1844-1889), A Sunset in Waioming [sic] 1889. Oil on canvas. 20 x 36 inches. French artist Jules Tavernier (1844­–1889) was one of the American West’s pioneering talents and a great adventurer. This exhibition surveys the artist’s career, presenting a hundred works of art. It includes his early transcontinental illustrations for Harper’s Weekly, paintings of Native American subjects, and scenes of the San Francisco Bay area and the Monterey Peninsula. 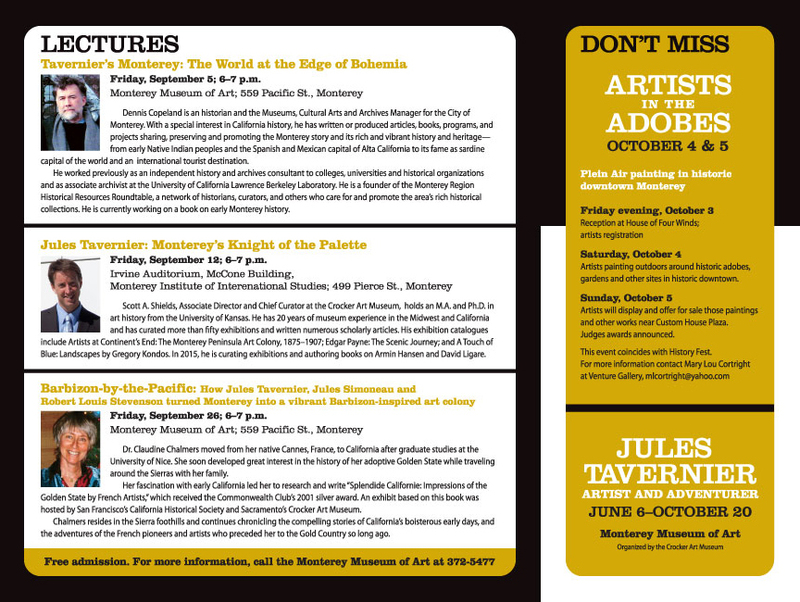 With this sojourn he launched Monterey’s status as an emerging art colony in 1875. Tavernier is credited as the artist who started it all in Monterey and his reputation continued to grow in California. He flourished in the budding social and cultural scene, leading a colorful life. The artist became a member of San Francisco’s newly established Bohemian Club, hosting elaborate parties and taking part in celebratory outdoor revels. The Monterey coast’s natural beauty appealed to Tavernier’s imagination and his penchant for landscape painting, drawing on his early training in France. His Monterey period yielded some of the most audacious work of his career. The exhibition also features Tavernier’s signature paintings of erupting volcanoes, which he painted in Hawaii before his untimely death at age forty-five. Dennis Copeland is a historian and the Museums, Cultural Arts and Archives Manager for the City of Monterey. With a special interest in California History, he has written or produced articles, books, programs, and projects sharking, preserving and promoting the Monterey story and its rich and vibrant history and heritage – from early Native American peoples and the Spanish and Mexican capital of Alta California to its fame as sardine capital of the world and an international tourist destination. He worked previously as an independent history and archives consultant to colleges, universities and historical organizations and as associate archivist at the University of California Lawrence Berkeley Laboratory. He is founder of the Monterey Region Historical Resources Roundtable, a network of historians, curators, and others who care for and promote the area’s rich historical collections. He is currently working on a book on early Monterey history. Scott A. Shields, Associate Direct and Chief Curator of the Crocker Art Museum, holds an M.A. and Ph.D. in art history from the University of Kansas. He has 20 years of museum experience in the Midwest and California and has curated more than fifty exhibitions and written numerous scholarly articles. His exhibition catalogues include Artists at Continent’s End: The Monterey Peninsula Art Colony, 1875-1907; Edgar Payne: The Scenic Journey; and A Touch of Blue: Landscapes by Gregory Kondos. In 2015, he is curating exhibitions and authoring books on Armin Hansen and David Ligare. Dr. Claudine Chalmers moved from her native Cannes, France, to California after graduate studies at the University of Nice. She soon developed great interest in the history of her adoptive Golden State while traveling around the Sierras with her family. Her fascination with early California led her to research and write Splendide Californie: Impressions of the Golden State by French Artists, which received the Commonwealth Club’s 2001 silver award. An exhibit based on this book was hosted by San Francisco’s California Historical Society and Sacramento’s Crocker Art Museum. Chalmers resides in the Sierra foothills and continues chronicling the compelling stories of California’s boisterous early days, and the adventures of the French pioneers and artists who preceded her to the Gold Country so long ago. Organized by the Crocker Art Museum, the exhibition is accompanied by a fully illustrated scholarly catalogue—the first to feature Tavernier exclusively. The book features essays by Scott A. Shields, Ph.D., the Crocker’s chief curator and associate director, as well as Claudine Chalmers, Ph.D., and Alfred Harrison, Jr. The Monterey Museum of Art at MMA Pacific Street presents: Jules Tavernier: Artist and Adventurer. Exhibition dates: Friday, June 6 to Monday, October 20, 2014.The exhibitionopens to the public on Friday, June 6, 11:00 am – 5:00 pm, Members reception from 5:30 pm – 7:30 pm. Museum members free, $10 non-members.